A Coffee and Cards treat again. Now there is a chill in the air early morning and night time, thoughts turn to winter woollies, snuggling up in front of the fire, hot cocoa and crumpets, well mine do anyway. 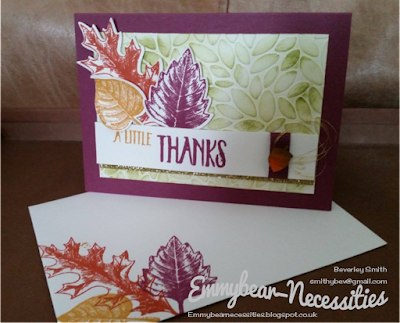 I love this time of year for the autumn leaves, the colours are so rich and combined looked stunning so I was delighted when it was suggested we made an Autumnal card. 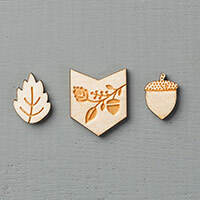 Susan gave us a couple of options of design using the Vintage Leaves stamp set. She also incorporated the most gorgeous little Into the Woods embellishments and we were each able to choose the one we wanted. In fact I love them so much, they have been ordered for me today. Rather than me explain how we made the cards, I'll post the link to Susans blog so you can see for yourself. 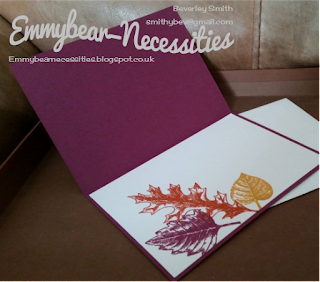 For me, the main difference is that I used the embossed rather than debossed side. While some demonstrators prefer you to slavishly copy, we are encouraged to go "off piste" and alter the design to suit which follows the Stampin' Up ethos "Inspire, Create, Share"